Like all JFKS educational programs, the entrance class is designed to enhance learning and social development in a bilingual and bi-cultural environment. By assisting each child’s integration into the school community and teaching appropriate social behavior in building respect for the rights and feelings of others, the entrance class serves as developmental bridge between the family and the broader world. 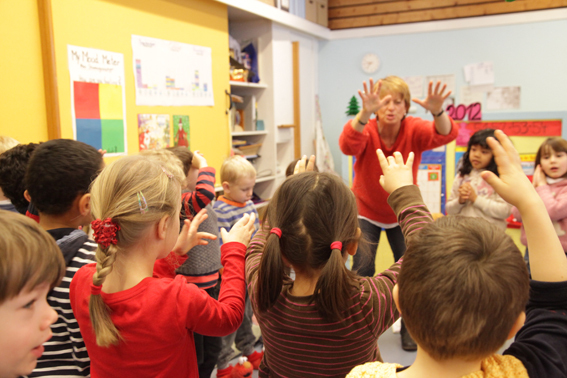 Children learn to listen and wait their turn and gain confidence by expressing their ideas in front of their classmates. Singing in both languages as well as arts and crafts projects play an important role in the Entrance Class, supporting the children’s language and fine motor skills development. The Entrance Class students have one hour of physical education taught at the JFKS gym. The entrance class offers a preschool curriculum, which is designed to prepare the children for learning in school, writing and early math. Pre-literary mother tongue lessons in German and English are introduced to the children in the second half of the school year as is a special early math program, “Math Their Way”. At JFKS there are no single language classes; in every homeroom German and English speaking children learn and play together. Instruction in the classrooms is held in both languages at once. Most JFKS students are admitted into the entrance class which starts one year before first grade, and turn five the calendar year they start entrance class. The JFKS Music Department offers a Suzuki violin program for children in entrance class, for more information please check in the Fine Arts section under The Suzuki Violin Program. The school day for the entrance class starts at 8:55 and lasts until 13:05.